Hatsune Miku Project Mirai DX , a rhythm game developed by Sega for the Nintendo 3DS, launched in North America in 2015. It’s an update to Project Mirai adding “tap” gameplay and a “My Room” mode that allows you to spend your “Music Points” you gather while playing. Project Mirai DX also has an augmented reality function, but I haven’t invested much time in it. The gameplay consists of standard rhythm game fair. Match your input to the on-screen prompts, simple and always effective. There are two ways to play though--Tap controls and Button controls. Tap Controls consist of tapping and sliding on the drum shaped icons. This is how I started the game and enjoyed it most. Failure is a reality in this game. Some of the songs hit over 190 BPM and require simultaneous button inputs, which makes for pretty interesting and complex gameplay. Project Mirai DX’s difficulty curve deserves praise too. These advanced elements aren’t introduced until the player chooses to engage them. Graphically Project Mirai DX didn’t impress me until I played with the 3D enabled. 3D makes the chibi sprites pop and I was surprised how much of a difference it made. Unfortunately I have an original 3DS and the 3D gives me a headache after more than five minutes of use. It’s a shame because the 3D works wonderfully. 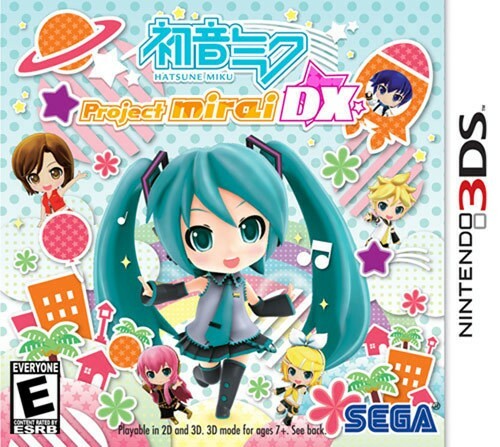 Rhythm games need great music and for the most part Project Mirai DX does. There’s a satisfactory 48 songs to master and you’ll enjoy a lot of them on the first play through. You can customize your vocaloid’s performance by changing up their hairstyle and outfits. I liked this feature, but ultimately wanted more customization options. I would have loved to be able to play every song with any vocaloid, and it would’ve satisfied my desire for more Luka and Gumi, but you can’t. As an otaku that normally wouldn’t play rhythm games, I’m very happy with this one. It’s fun and easy to pick up and I look forward to mastering it. I procrastinated on buying this game until it was finally gifted to me and I honestly regret it. I can’t wait to get my hands on the PS4 version.